Centaury, also known as Christ's Ladder and Feverwort, is a member of the gentian family that is native to Europe, Asia and Africa. 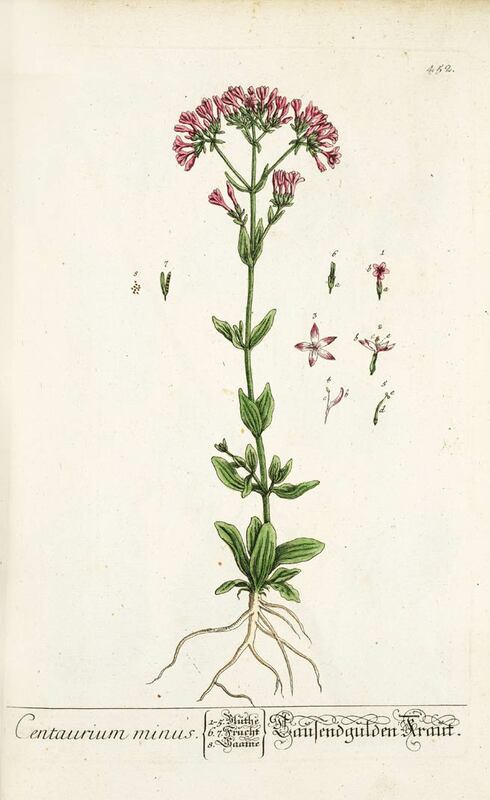 The plant is named in honor of the centaur Chiron, the figure from Greek mythology who was reputedly so skilled in the herbal arts that he successfully negated the lethal effects of a wound inflicted by a poison arrow. Today, the entire herb is harvested for use in teas, infusions and tonics. Centaury is an annual, with a yellowish, fibrous, woody root, the stem stiff, square and erect, 3 to 12 inches in height, often branching considerably at the summit. The leaves are of a pale green color, smooth and shiny, their margins undivided. The lowest leaves are broader than the others, oblong or wedge-shaped, narrowed at the base, blunt at the end and form a spreading tuft at the base of the plant, while the stalkless stem-leaves are pointed and lance-shaped, growing in pairs opposite to one another at somewhat distant intervals on the stalk, which is crowned by flat tufts (corymbs) of rose-colored, star-like flowers, with five-cleft corollas. The stamens are five in number: the anthers have a way of twisting themselves around after they have shed their pollen, this being one of the distinctive points between the plants of this genus and those of the genus Gentiana, with which it has much in common, having by some earlier botanists been assigned to that genus, under the name of Gentiana centaurium, or Centaury Gentian. The flowers open only in fine weather and not after mid-day. A variety is sometimes found with white corollas. The name of the genus to which it is at present assigned, Erythraea, is derived from the Greek erythros (red), from the colour of the flowers. The ancients named the plant Fel Terrae, or Gall of the Earth from its extreme bitterness. The Old English name of Felwort is equivalent in meaning to this, and is applied to all the plants of the Gentian family. Centaury is a widespread plant of Europe and parts of western Asia and northern Africa. It has also naturalized in parts of North America and throughout eastern Australia, where it is an introduced species. Centaury grows in sunny woodland garden edges, meadows and dappled shade locations. Centaury prefers a well-drained sandy loam soil with some peat. Sow seeds from February to May outdoors in the garden, germination is usually rapid. The whole plant can be harvested in July, when just breaking into flower and dried. The plant has a slight odor, which disappears when dried. Cut the dried flowers, stems and leaves into smaller pieces then store in an airtight container in a cool, dry place. 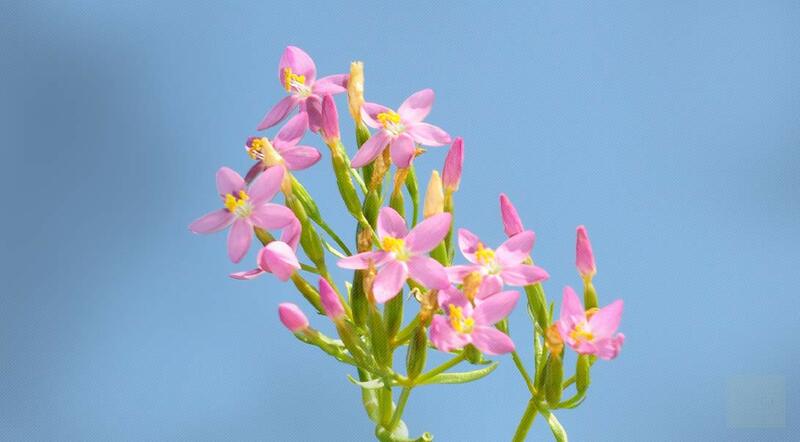 Centaury (Centaurium erythraea) is a member of the gentian family of flowering plants native to Europe, Africa and Asia now naturalized in much of North America. This plant is characterized by its prolific bloom of lavender-pink flowers that appear in clusters on tall, leafy branches. Unfortunately, this plant resists being grown as an ornamental in most home gardens, preferring the rocky, dry soil along cliffs and unruly pastures instead. However, this herb is anything but elusive since it is known by a host of common names. A mere sampling: Christ's Ladder, Feverwort, Bitter Clover, Rose Pink, Wild Succory and Eyebright (not to be confused with Euphrasia officinalis of the same name). The genus name of this plant has undergone revision, being previously known as Erythraea in apparent reference to the color of the plant’s flower since the word in Greek means “red.” Before that, the genus was designated Chironia in honor of the ancient herbalist from Greek mythology, Centaur Chiron. Reputedly, he was so skilled in the botanical arts that he saved himself from an accidental encounter with the tip of a poisoned arrow. It seems that modern botanical nomenclature has settled on the original nomination to represent this genus going forward.